The elven nation of T'Nanshi's roots lie all the way back in the creation of Avlis. Legend holds that it was the general location of the prison that held Dru'El when he was a mortal prisoner kept by the evil Negerai. 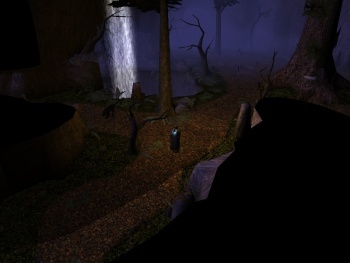 Whether this is true or not, the site of the creation of the first elves was somewhere in the ancient forests of T'Nanshi, and they have remained in the area since then. The name T'Nanshi is translated loosely as "Spirit Land". The name comes from a very ancient dead language thought to have been spoken by the nature spirits who inhabited Avlis well before the arrival of the nine prisoners and the Negerai. This language has largely been lost, but the present day elven language is thought to be derived from it. Dru'El was said to be interested in recovering the lost language, and he gave what fragments he found to his elves. This is why the elven language on Avlis differs quite a bit from the language spoken by elves encountered on other planes. The forest of T'Nanshi is, in general, extremely dangerous, with many large wild predators deep in the wild, and powerful bandits preying on the roads. Over time, the word for spirit came to be the same as the word for elf. 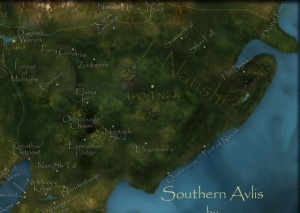 Thus, T'Nanshi is now derived from the phrase "Land of the Elves". The capital of T'Nanshi is Le'Or T'Nanshi, a separate server. The city of Elysia is historically tied to T'Nanshi. For recent events, see T'Nanshi: Recent Events. This page was last edited on 10 June 2016, at 21:29.